The United States Patent Office is a government agency that issues patents to inventors and businesses to guard their designs from being copied by competitors, usually for a period of 17 years. The Office is unique among all federal agencies because it operates solely on fees collected from its customers and does not require any taxpayer dollars to run. Its goal is to control and index the issuance of patents. The legal basis for our patent system stems from the United States Constitution Article 1, Section 8: The Congress shall have Power ... To promote the Progress of Science and useful Arts, by securing for limited Times to Authors and Inventors the exclusive Right to their respective Writings and Discoveries. By cataloging and protecting the combined state of art of our technology, this system also helps strengthen the national economy at the same time. Headquartered in Arlington, Virginia, the U.S. Patent Office is as large as a college campus and consists of 11 buildings in a city-like development, employing almost 12,000 people. Of these about two-thirds are the examiners — the people who review your application to see if it has any merit. Composed mainly of scientists and engineers, this group is quite savvy to the latest technology and they have colossal resources of information at their fingertips. In the 228 years since the inception of the Office, they have granted ten million patents on every conceivable subject known to man. This makes it frustrating to see an inspiration for an invention go down in flames when you find out your “invention” has been thought of years before by someone else. Besides, it is a very slow process and can take years before a patent may be granted. The procedure is straightforward and costly. When an examiner gets your application they first do a search to see if anything even remotely like it has ever been patented before. If one of the claims pops up somewhere in an earlier patent, they will reject your application until you re-submit an abridged version. You of course have to pay more money for this change. But, as you will soon see, there is a limit as to how far in the past they can research. Back in 1836 the U.S. Patent Office leased several floors of the old Blodget Hotel in Washington, D.C. Not being a very big operation at that time, it seemed like a reasonable place to work out of and the offices were roomy and well lit with large windows, this being 50 years before electric lights came about. 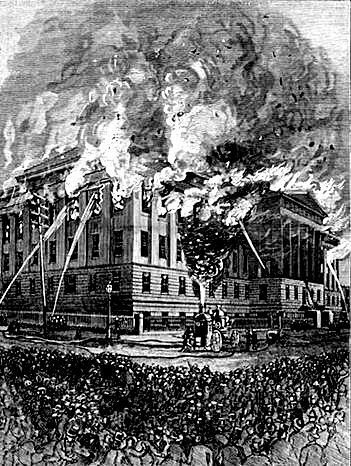 Besides the Patent Office, the Postal Service also leased offices there, and they were certainly assured of safety because the city’s modern fire department was also in the same building, so what could go wrong? At 3 a.m. on December 15 a fire started in the basement of the building. It is said that Patent Office employees stored firewood in the same cellar near where Post Office employees disposed of the hot ashes from their stoves. It is speculated that sometime after midnight the hot ashes ignited the firewood. No matter, the alerted firemen that live in the hotel can douse the flames. Unfortunately, the fire engine company downstairs was in the process of servicing their equipment that week and nothing was ready. This cost valuable time, forcing a human bucket brigade to attempt to extinguish the flames. Another engine from a department across town arrived too late, allowing the fire to take hold. Because the water supply of the hotel was insufficient the quickly spreading flames consumed the building. Little survived besides charred models and burned piles of paper. All records of over 10,000 patents issued over the span of 46 years were lost. This event is listed on the USPO website and most early patents are indeed missing. For example, you can find Patent 1, issued on July 31, 1790 to Samuel Hopkins for an improvement “in the making of Pot ash and Pearl ash by a new Apparatus and Process,” signed by none other than President George Washington himself. But, you cannot find patent number 2 – it is simply gone from their collection. Patent 71 is missing but patent 72, issued to Eli Whitney for the cotton gin, seems to be in shape. Many of the recovered patents were copies received back from the original inventors and the office is still working to this day to fill in the gaps. Sometimes the early patents are found in old attics or basements by people going through dusty chests or trunks. In 2004 fourteen more patents were recovered from the Dartmouth College archives, many of these granted to Samuel Morey a New England inventor. One 1834 patent of the group was for an internal combustion engine, possibly the first in the world. How the inventor’s patents wound up in New Hampshire is easy to trace. Morey’s father was a devout student of Eleazar Wheelock, the college’s founder. Being understanding souls they relented and moved on to burning the White House next. Old Gerry has to get to Center City before the bank closes at 4 p.m. He can ride the slow stagecoach but it will arrive exactly at 4. If he walks the entire distance he will still be a mile away when the coach arrives, assuming they leave at the same time. When the coach stops along the line for 30 minutes to rest the horse Gerry would have already walked 4 miles. But Gerry found a clever way to get to town 15 minutes ahead of the coach. What did he do and how far was the bank?